It’s time to ‘get crackin’! All you need are some plastic eggs…the rest is in this FREE download! This product is editable in PowerPoint! Simply click in the text box and type the words (sight, CVC, blend, digraph, etc) you want your students to practice reading, writing and using! You can change the font size, type and color! It includes the recording sheets and directions for use. Plastic eggs are not included. Great for an Easter/Spring center or party activity station! Use it with an ‘oviparous’ unit of study too! Find more fun Easter/Spring holiday goodies and resources by clicking here! 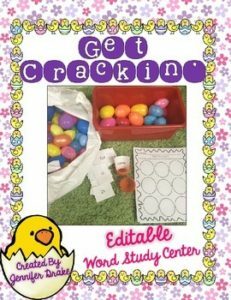 Happy Egg Editable Word Study Center Fun!